This year has seen an explosion of bohemian-inspired weddings, with a rise in barefoot weddings, outdoor ceremonies, and floral crowns in abundance. This floaty, feminine theme lends itself well to weddings, and small details can make a big impact! The key to this style is relaxed and carefree, whether whether holding celebrations on a beach, festival-style in a field or in woodland. Seasonal wildflowers and a mixture of foliage work well in loosely styled bouquets and simple table arrangements in mismatched glass jars, and can be carried through to larger installations, for example floral wreaths, chandeliers or ceremony decor. 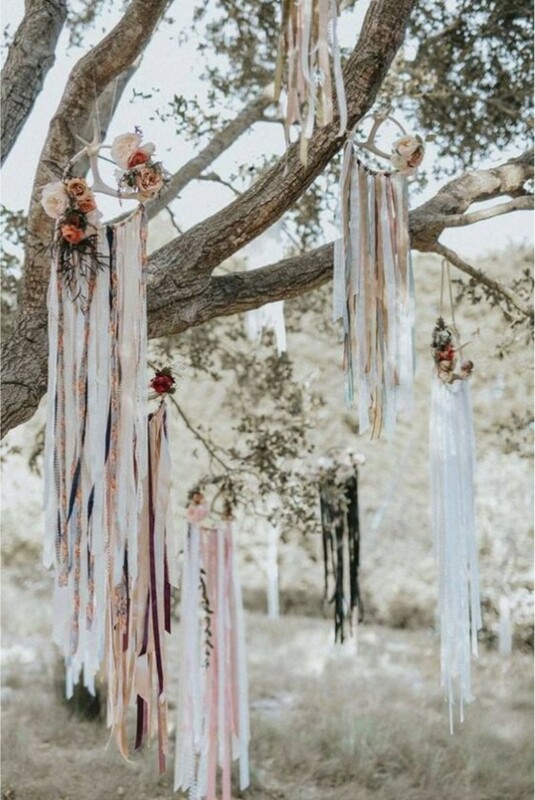 Dreamcatchers lend a quirky twist, and grouped together can make a stunning focal point or backdrop for photos. If holding the reception outdoors, think casual seating (low tables and rugs or floor cushions work beautifully) and picnic style food or sharing platters. A breakout space for smaller guests complete with teepee can also tie in the theme well. I love the recent trend for flowing lace dresses and carefree hairstyles - add a simple floral crown or whimsical embellished headband for instant boho chic! Copyright 2018 The Planning Lounge. All rights reserved.